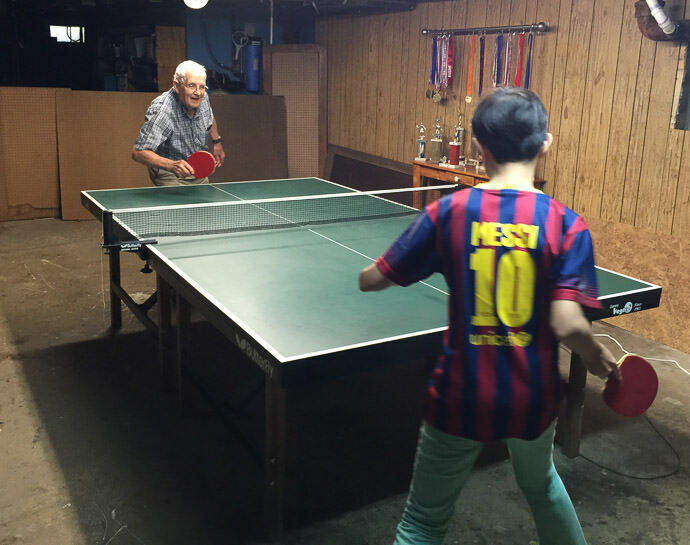 I played a bit of ping-pong today with a family friend, 91-year-old Vernon Weingart. I almost didn't lose. He is the personification of “kindly grandfather type”, who walks slowly and with purpose, always has a kind word and an easy smile. We all knocked the ball around for a while, then as we were about to leave, he suggested an actual game. A real game with Anthony wouldn't have been fun (Anthony would have been utterly crushed), but I offered some hope that he'd have to at least keep one eye open. And suddenly his demeanor completely changed. Gone was the kindly smile, replaced by eyes with laser focus and determination. Take no prisoners. It was a shocking transformation, but in retrospect it's unsurprising, given his competitive achievements. I'm not great at ping-pong, but I'm not bad either. I can inflict some wicked unpredictable spins, and at times can smash with thunderous power, even from behind and below the table. I won the first game after going to deuce. He won the next two. Both games were close... I suspect that's how he crafted it, to keep it interesting. He aced me on his serve only once. We ended with a firm “good game” handshake, and a promise that I'll give him a better game next time. But in my defense, he's not really 91 years old yet... his birthday is tomorrow. UPDATE: I gave him that rematch. 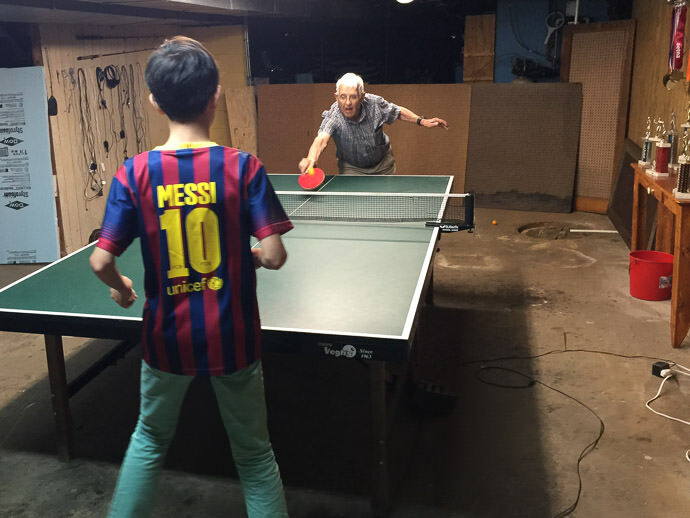 August 24th, 2015 Ping Pong Rematch Against Vernon! Great story! Happy birthday to him! Great to see these pages and that my friend Vernon is still active in Table Tennis. When we met, around 1971, he was the ‘older guy’ playing Table Tennis with a bunch of us Teenagers and College kids at Eastway Recreation Center at Kent State University. He was in his 40’s then. Vern was always an enthusiastic and selfless supporter of our local Table Tennis and my efforts promoting it with clubs and tournaments in Northeast Ohio. I remember him limping into the Akron Table Tennis Club at Patterson Park with his racket taped into his hand weeks after a near fatal head-on car accident in his 60’s, and his inspiring determination to fully recover his health and Table Tennis prowess. And that he did ! 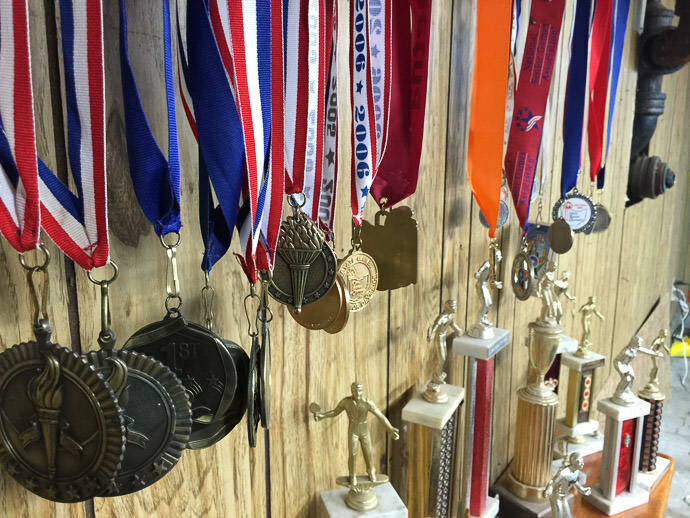 – Many of his State and National titles came years after that. Now, I’m in my 60’s and still coaching and competing myself , now in Connecticut . Vern is still an inspiration and great example as a player, and especially as an example of that great generation that contributed so much to our country and our local communities. God bless you Vernon !